That jewelry box full of unwanted gold jewelry could be turned into some extra spending money today! Rancho Gold & Jewelry is the most trusted place to sell gold jewelry in Las Vegas. Even if your gold jewelry is broken or blemished, we buy gold jewelry in any condition. Gold jewelry missing gemstones, scrap gold jewelry, and damaged pieces still have value. Even if the jewelry is no longer presentable, the precious metal it comprises will be surprisingly valuable! “Coin jewelry”, such as rings and pendants that feature solid gold coins or other precious metal coins, are common pieces of gold jewelry made of valuable precious metals. Visit the trusted experts at Rancho Gold & Jewelry to sell your broken gold jewelry today! At Rancho Gold & Jewelry, our experts use a level of care and precision, while handling your gold jewelry, that surpasses any jewelry buyers in the industry. 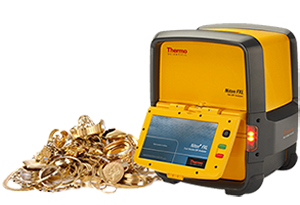 When we buy gold jewelry, we use a state of the art Thermo Scientific Niton XL2 Analyzer to determine its purity and value. Many jewelry buyers in Las Vegas still use a file and acid testing to attempt to determine the jewelry’s purity. This outdated method is often inaccurate and will cause damage to your jewelry. Our team of experts will help educate you on the value of your gold jewelry, through an honest and safe evaluation. Rancho Gold & Jewelry has been the leading place to sell gold jewelry in Las Vegas for over 30 years!.